Red Leicester members joined the Extinction Rebellion demonstration outside the BBC offices near Jubilee Square to urge the BBC to take the lead in promoting the truth about climate change (21st December 2018). The event in Leicester was one of several across the UK in places such as London, Cardiff, Glasgow and Manchester. You can read the Leicester Mercury’s report on the event here. Red Leicester singing at the Sing for Syria Concert (organised by University of Leicester UNICEF on Campus Society) at Christchurch, Clarendon Park Road, Leicester (4th December 2018). The free concert, which raised £329.74 for the UN’s Syria appeal, featured several choirs, amongst others Leicester Chorus, Amika and DMU Square Mile. Red Leicester members helped to send a message to the UN climate talks in Poland by being part of a human number 12 (the number of years left in which to take radical action against climate change), photographed from the Big Wheel in Jubilee Square and sent to the UN negotiators (2nd December 2019). The event was organised by Leicester Friends of the Earth. and Red Leicester led the singing of several anti-fracking and environmental songs (see video). The Co-operative Party invited Red Leicester to sing at their weekend school at the Hilton Hotel, Fosse Park (3rd November 2018). 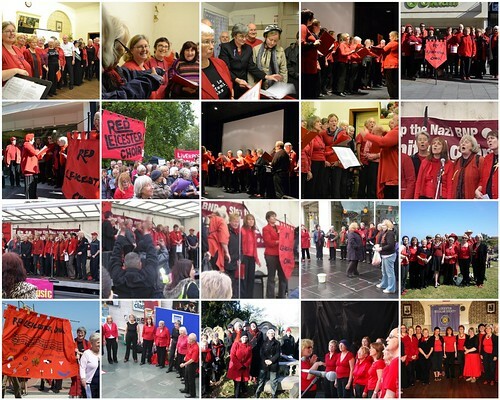 Red Leicester chose several appropriate songs expressive of collaboration and change including: Unison in Harmony; The Whole Wide World Around; Citizens’ Shanty; Power in A Union and the Internationale. Members of Red Leicester members joined with Fosse Singers and the DMU Square Mile choir in two performances of Alice In Her Shoes at Curve (25th/26th October 2018), a celebration of the life of Leicester suffragette Alice Hawkins written and performed by Elaine Pantling . The event was part of a year-long Leicester celebration involving the council and local schools and featuring the Curve events, the arrival of the Suffragette Flag, the unveiling of the Alice Hawkins statue and culminating the public event in New Market Square in March 2019. Earlier at an Equaliteas event (25th October 2018), the Alice choir met local schoolchildren at the old Equity Shoes factory (where Alice Hawkins worked) and led them in singing several songs from the show. Red Leicester’s monthly busk in Market Street (13th October 2018) raised £111 for the anti-austerity movement We Shall Overcome to raise money for those hardest hit by the government’s austerity policy. Red Leicester singing several peace songs at Leicester CND’s Peace One Evening (22nd September 2018). The evening also included other singers and performers, puppets, a splendid meal and rousing talks from various groups including Friends of the Earth, Save Our NHS and others. Red Leicester busked to raise £100 for the Kerala Chief Minister’s Relief Fund to alleviate the devastation caused by recent floods. (8th September 2018). Singers from Red Leicester joined family and friends at St Luke’s church in Leicester in remembering Julie Burnage, a longstanding member of the choir, who died recently. Many memories were shared of a woman with a huge passion for life and strong socialist and Christian commitments demonstrated, not least, through her work on behalf of refugees in Leicester. Julie loved singing with Red Leicester and she will be much missed by the choir; it was fitting, therefore, that the choir sang two of her favourite pieces – Song of Peace and Feeling Good – in her memory (31st August 2018). Red Leicester members joined Elaine Pantling (on left below) to perform several songs from her acclaimed one-woman show Alice in Her Shoes celebrating the life of Alice Hawkins, the Leicester suffragette and campaigner, at Curve’s 10th Birthday Celebrations (26th August 2018). Singers from Fosse Singers and DMU Square Mile choirs were also involved. Members of Red Leicester joined the thousands of people in London protesting at the visit of US President Donald Trump to the UK (organised by the Stop Trump Coalition). A Big Choir was assembled by the Campaign Choirs Network to serenade marchers on Regent Street singing songs with anti-Trump lyrics and sentiments (13th July 2018). Red Leicester sang two pertinent songs, Arrogance, Ignorance and Greed and Can We Afford the Doctor?, as a prelude to a talk by Professor Richard Murphy to the Secular Society in the Secular Hall (12th June 2018). Professor Murphy is a tax campaigner, academic and author of the book The Joy of Tax, with unorthodox but compelling ideas about taxation and the economy. Afterwards he paid tribute to the choir in his blog! 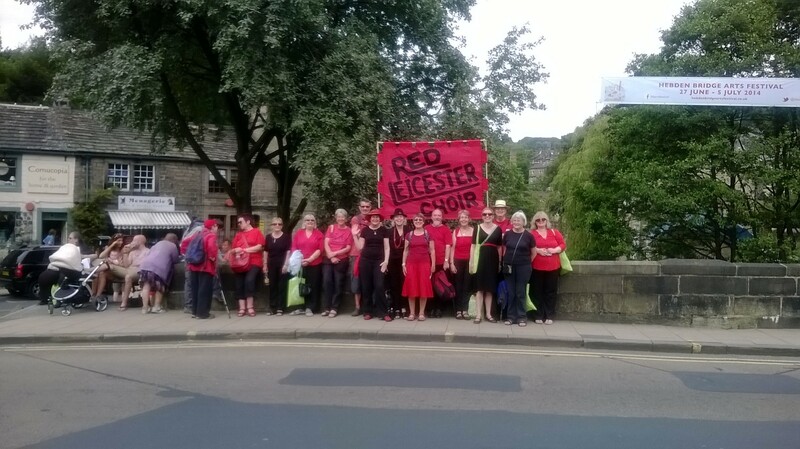 Members of Red Leicester joined singers from Leicester Amika to sing songs in support of Leicester Sing For Water at the Riverside Festival (3rd June 2018). Below is Red Leicester singing I Am A River and Deep Blue Sea. Singers from Red Leicester greeting the arrival and departure of the Anti-Poverty Bus Tour in Leicester organised by the European Minimum Income Network. Red Leicester sang several songs (you can view Ambrose Musiyiwa’s videos of these here). The photo below (again courtesy of Ambrose) shows Red Leicester singers plus City Mayor, Sir Peter Soulsby, local Bangra dancers and members of the EMIN bus tour (22nd/23rd May 2018). A few members of Red Leicester joined Friends of the Earth supporters in a vigil for the trees of Prebend Gardens (16th May 2018). You can view a video of this here. At the annual International Conscientious Objectors’ Day ceremony on (15th May 2018) on Peace Walk, Red Leicester sang several songs following news about Eritrean refugees and an update on the 2017 Leicester Charter on the militarisation of young people (you can sign this here). A small slice of Red Leicester sang Unison in Harmony and There Is Power In A Union at the International Workers’ Memorial Day event in Town Hall Square (28th April 2018). Leicester South MP and Shadow Health Secretary Jon Ashworth posted a video of the choir singing on his Facebook page. Red Leicester sang Bandiera Rossa and the Internationale at a ceremony honouring three Leicester men (Roy Watts, Fred Sykes and Jack Watson) who died fighting in the Spanish Civil War. See more in the Leicester Mercury (30th March 2018). Red Leicester singing at its annual Fundraising Ceilidh (10th March 2018) with Greenshoots Ceilidh Orchestra at the Ukrainian Hall. The evening raised just over £714 for our chosen charity, the Real Junk Food Project, who also provided all the food (photo courtesy of Ambrose Musiyiwa/Civic Leicester). Red Leicester sang several peace songs at the opening of the Art and Protest Exhibition (27th February 2018) in the Basement Gallery of the Adult Education Centre, Belvoir St. The exhibition was illustrated through the work of local artist and veteran peace campaigner, Anna Cheetham (pictured below with Red Leicester, Leicester Mayor Sir Peter Soulsby and Bruce Kent – photo courtesy of Ambrose Musiyiwa/Civic Leicester). Red Leicester joined singers from other choirs at the ceremony to mark the unveiling of the statue of Leicester suffragette Alice Hawkins in the new Market Square (4th February 2018). Elaine Pantling, reprising her role from her one woman show Alice In Her Shoes, once again inspired the crowds. She led the march and gave a speech in Alice Hawkins’s own famous words as the 7ft statue was revealed (read more about the event on the Leicester Mercury website). There was even a photo on the front page of the Guardian (see below)! Members of Red Leicester and Leicester Friends of the Earth protesting inside and outside Barclays bank in Leicester at the bank’s lack of clarity on when they would fulfil their pledge to disinvest from Third Energy, the company intent on fracking in Ryedale (2nd December 2017). More photos are on the Leicester FoE Facebook page and a report on the protest appeared in the Lutterworth Cloud. Click here to see a video of the audience at the end joining with the choir in singing one of the show’s songs, Rise Up Women. 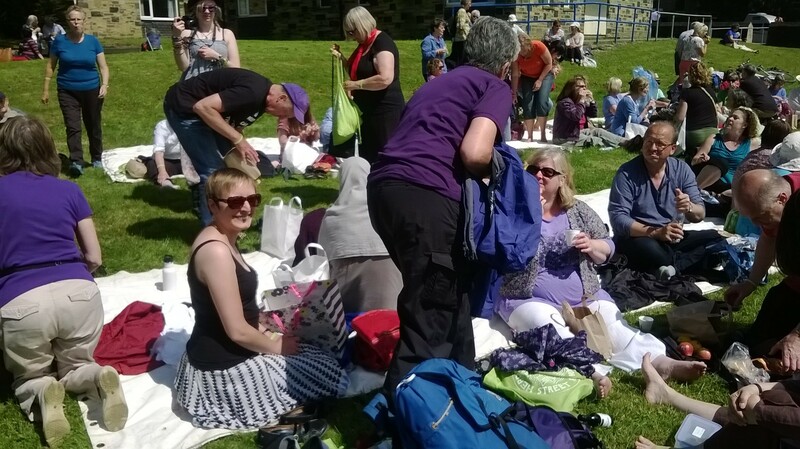 For more photos of Red Leicester at the Street Choirs Festival in Kendal, click here. Ambrose Musiyiwa has taken a number of photos and videos of Red Leicester performing, which can be seen on his CivicLeicester facebook page. 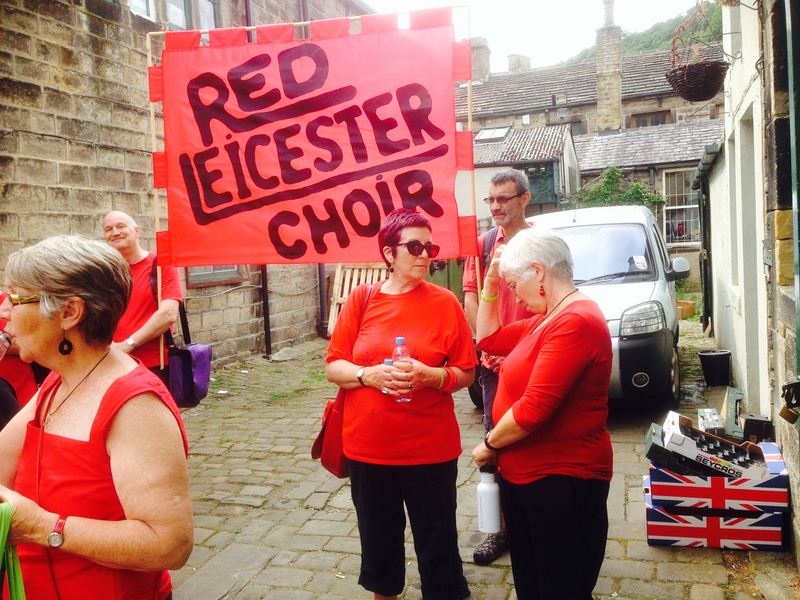 Some videos of Red Leicester singing can be seen on YouTube. Videos of Red Leicester performing four songs at the Street Choirs Festival in Leicester in 2016: You’ve Got a Friend, Walking Into Battle With the Lord, We Will All Go Together When We Go and Feeling Good. 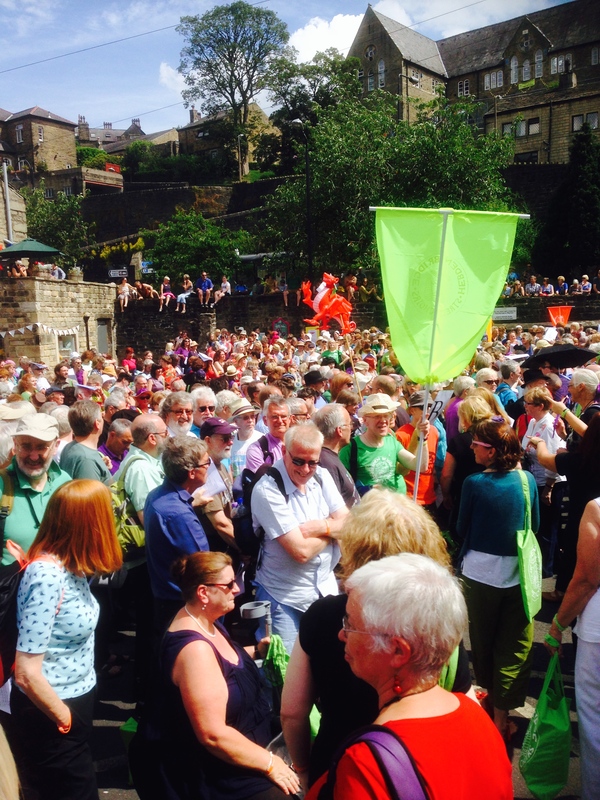 Photographs of Red Leicester members at the Street Choirs Festival in Hebden Bridge in 2014. Red Leicester performing at the Street Choirs Festival in Aberystwyth in 2013.